It’s been an interesting few nights for the moth trap this week. The moths themselves have been fairly unremarkable, but for some reason the trap has been attracting all sorts of other insects. 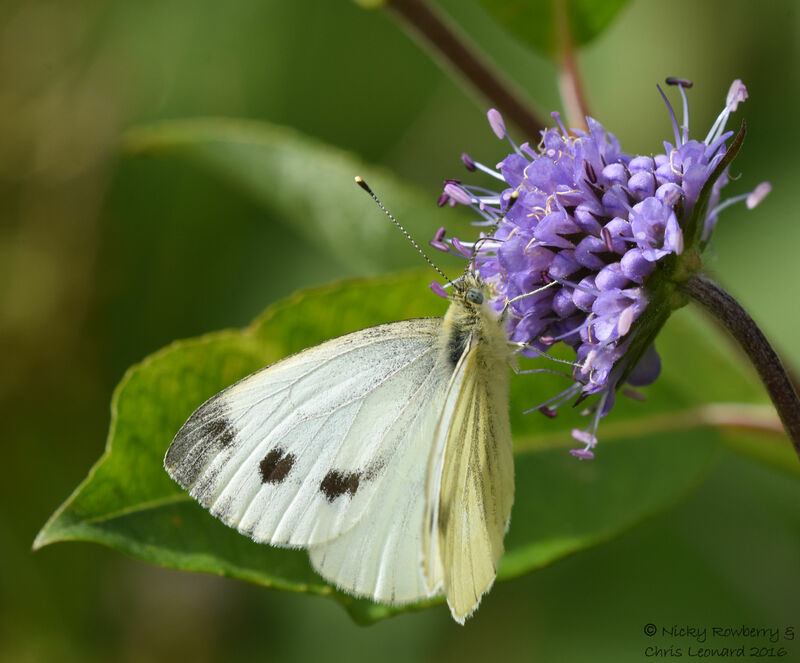 Not that I mind – it’s all good news for the biodiversity of the garden. 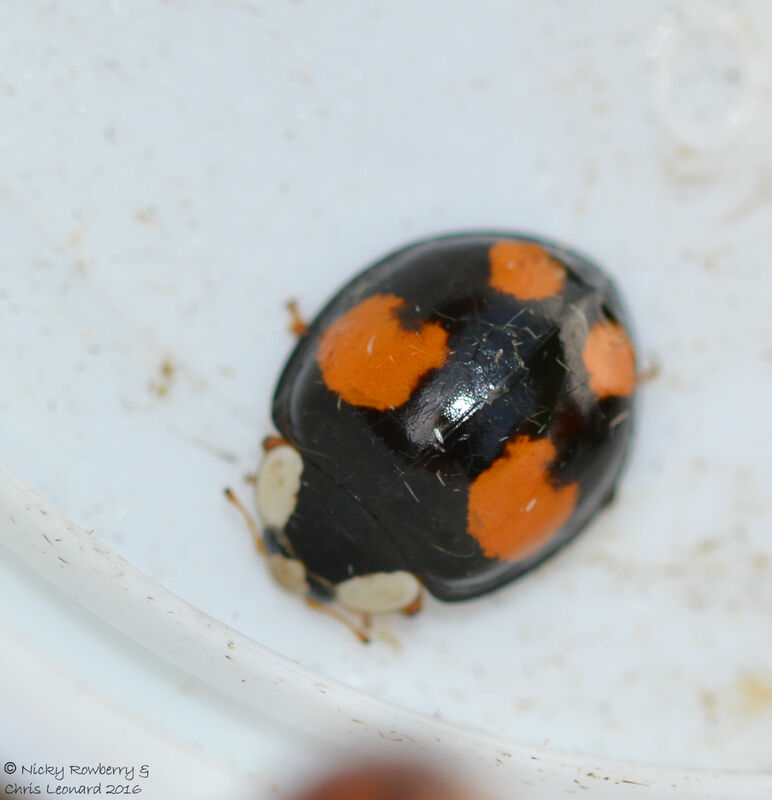 Well mainly good news – one of the surprises of the moth trap this week was an influx of Harlequin Ladybirds (Harmonia axyridis). I found at least 12 of them in the trap from Tuesday night. The Harlequin is a non-native ladybird, originating from Eastern Asia. The species was first found in the UK in 2004. 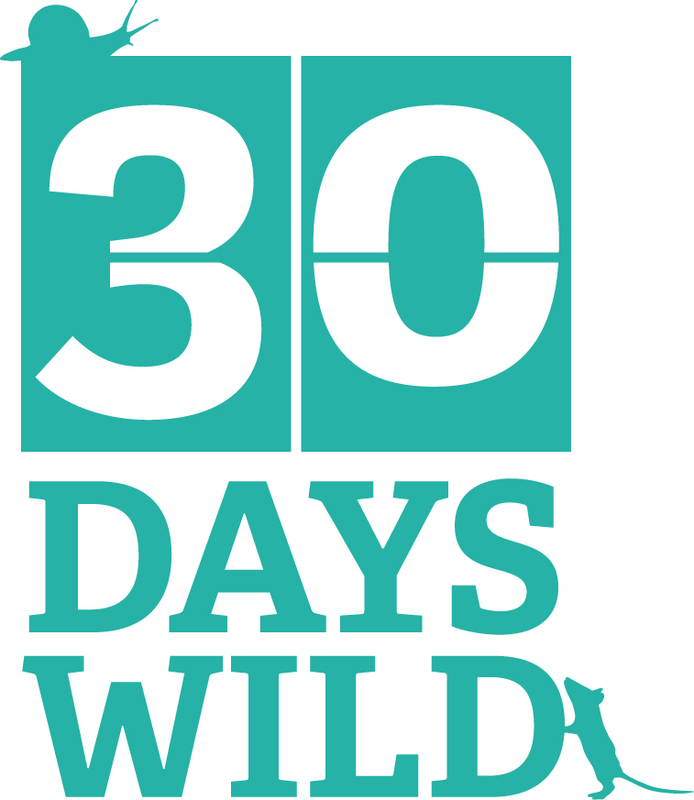 It’s got a wider range of food preferences and a longer breeding season and is basically out-competing our native species and spreading rapidly across the country. So finding 12 in my trap in one go, probably isn’t good news for the other ladybird species in our garden. Especially as this pair seemed keen on producing more Harlequins. 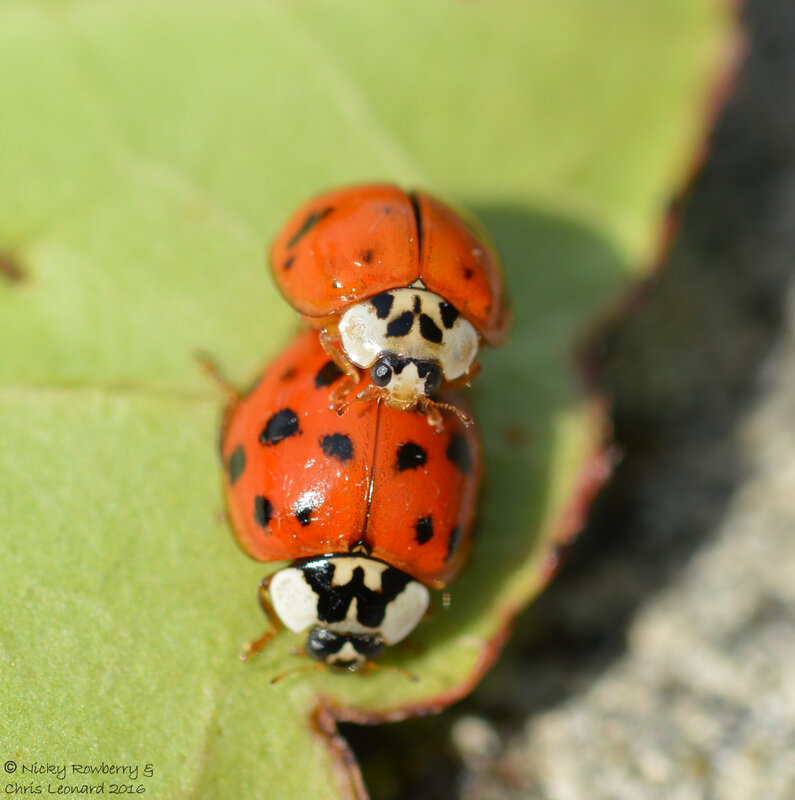 The Harlequin ladybirds have a huge variety of colour variations, making them difficult sometimes to distinguish from our native species. (one of the reasons the Ladybird survey people don’t advocate killing the Harlequins – just in case you’ve got it wrong!) Most of the ones from the trap were red, but there were a couple of these black ones too. The only thing to do with them was submit my sightings to the Harlequin Ladybird Survey. Fortunately Harlequins weren’t the only non moth species in the trap. There were the usual selection of wasps, diving beetles (which surprised me no end the first time they turned up in the trap! ), caddis flies, daddy-long-legs and assorted flies. 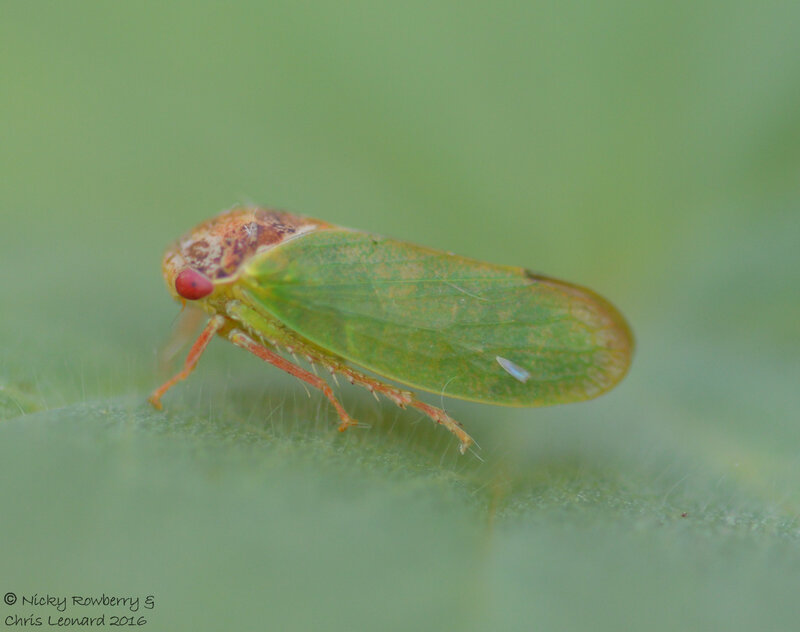 But most interesting were a selection of Leafhoppers and Froghoppers – subsequent IDs revealed 4 species. These first two are Leaf Hoppers (I’m still not sure what makes a Hopper a leafy one or a froggy one). I can’t find common names for either of them although they are apparently quite common species. I guess not enough people look at these tiny insects for anyone to have bothered giving them English names. The first one was a lovely green insect with red eyes (maybe I should invent common names – the Ruby-eyed Emerald Leafhopper!) called Iassus lanio. One thing I’ve found all these Hoppers have in common is the ability to ping away in a split second as you try and photograph them. They seem quite sedentary lazy creatures one minute, then suddenly ping – they’ve gone. So I didn’t get much time to compose and focus beautiful photographs! 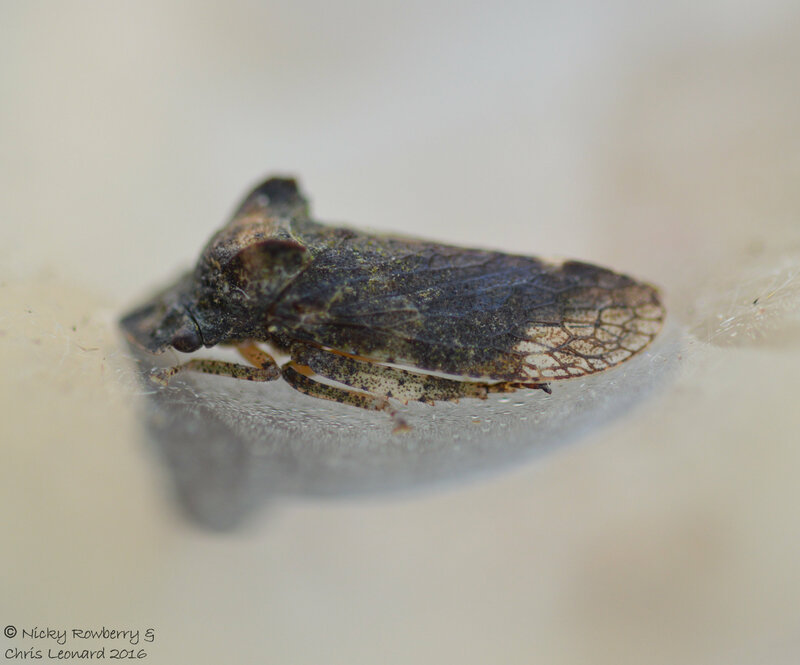 The next one is a froghopper and has actually managed to get itself a common name – the Alder Spittlebug (Aphrophora alni). The immature stages of these bugs form foamy nests on plants (frog spit or cuckoo spit) which help them regulate moisture and temperature. 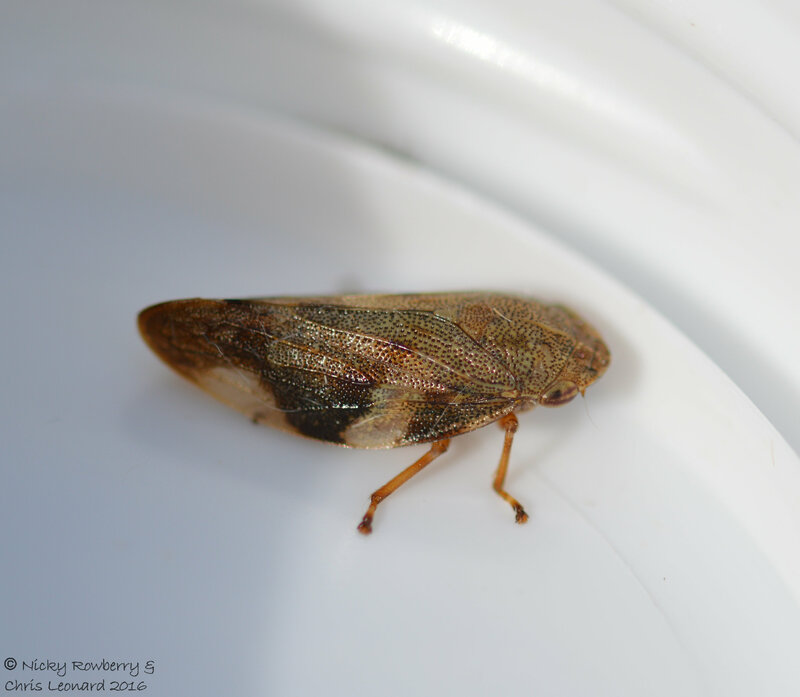 The final one was a very large leafhopper, the largest British species in fact – Ledra aurita. 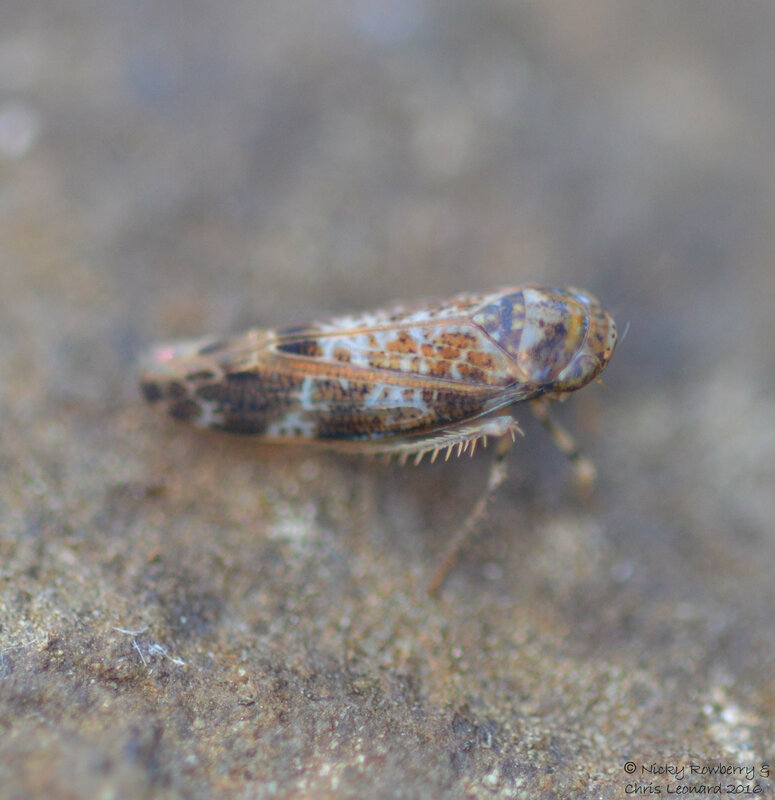 It’s common name on one website was given as Eared Leafhopper, although Horned Leafhopper would seem more accurate to me. It is normally very well camouflaged on trees, but stands out a bit in a moth trap. All these insects appeared in the moth trap on Tuesday night, but on Friday night the same trap in the same location didn’t catch anything but moths! 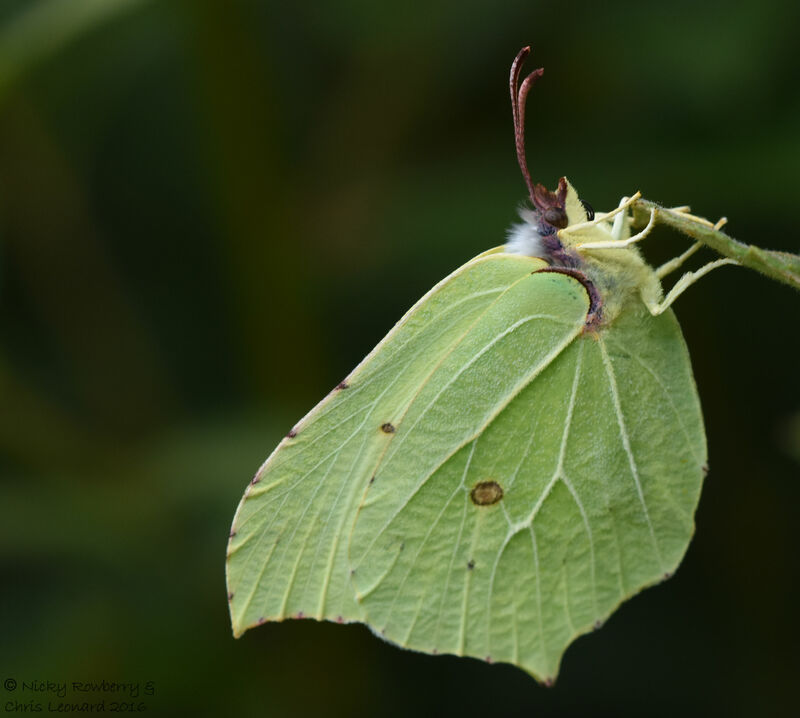 Grafton Wood in Worcestershire is one of our favourite butterfly spotting locations and at only a half hour drive away provided the perfect day out yesterday. 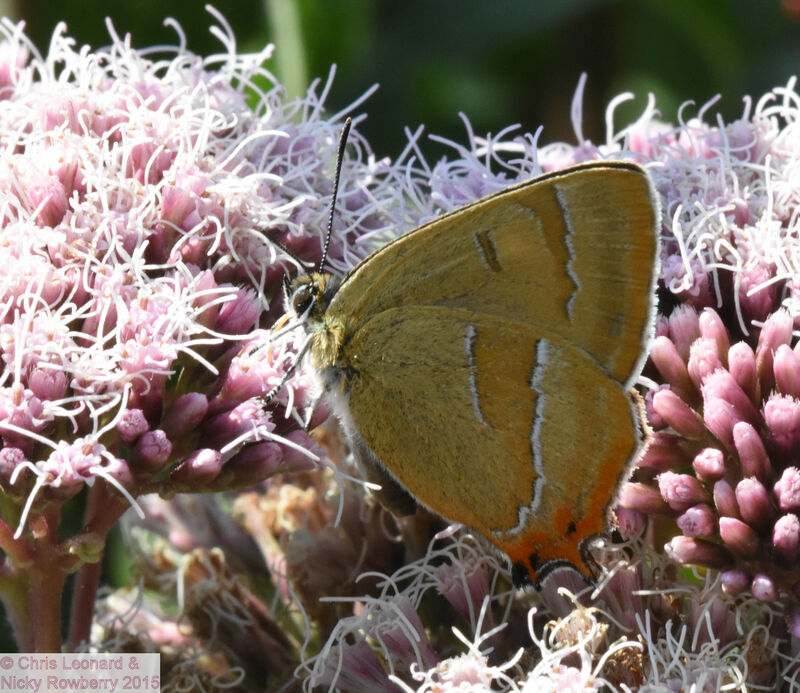 We went seeking the Brown Hairstreak, as we’d seen them there before. 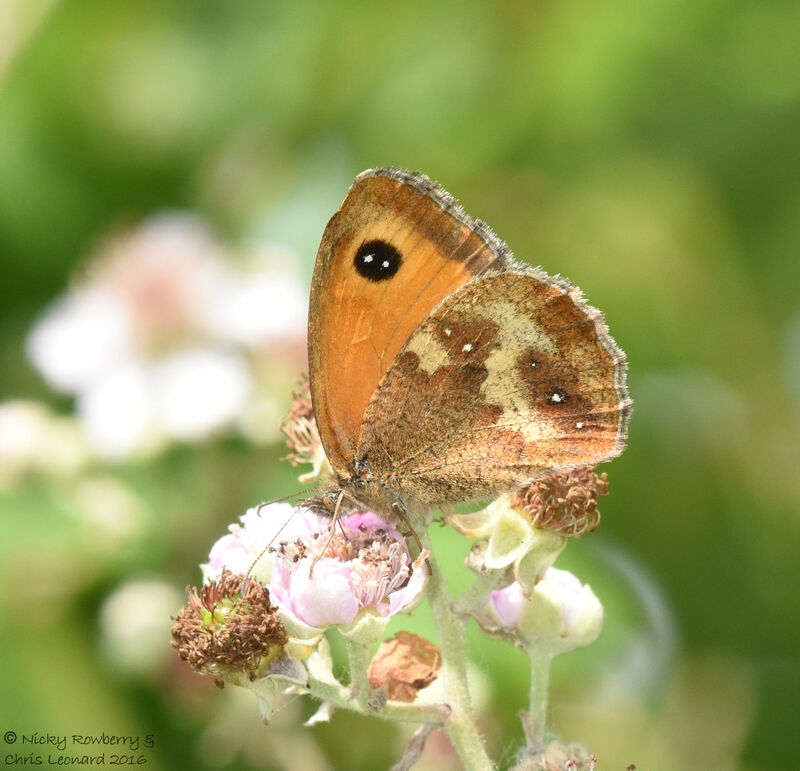 This is Worcestershire’s rarest butterfly and Grafton Wood is its stronghold, but unfortunately yesterday the Brown Hairstreak refused to put in an appearance. Hopefully we’ll have chance to go back later in the month, but in the meantime here’s one we photographed last year. 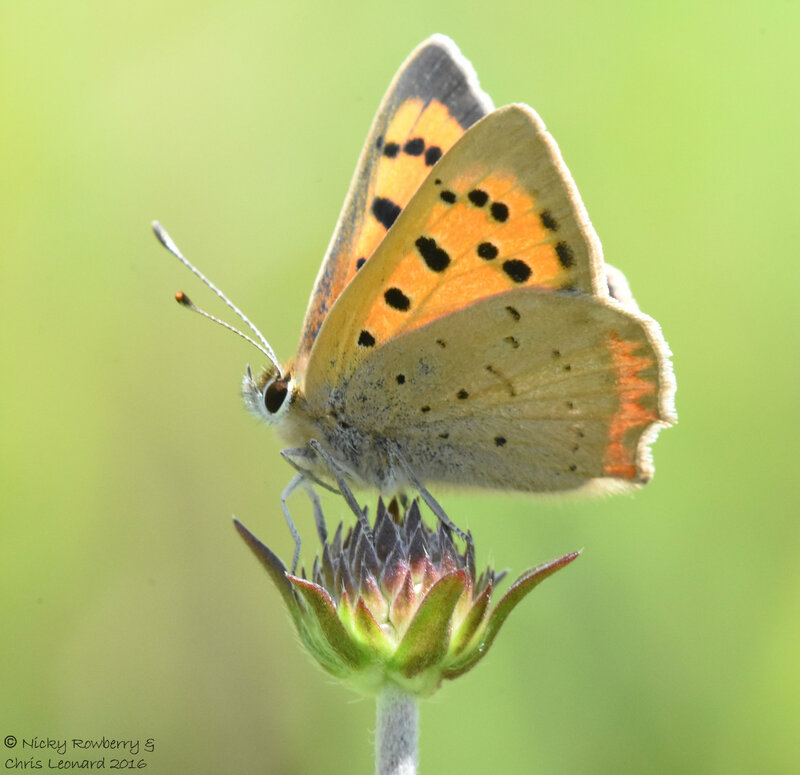 We may not have seen the Brown Hairstreak yesterday, but we did manage 14 other butterfly species, so we’re not complaining. 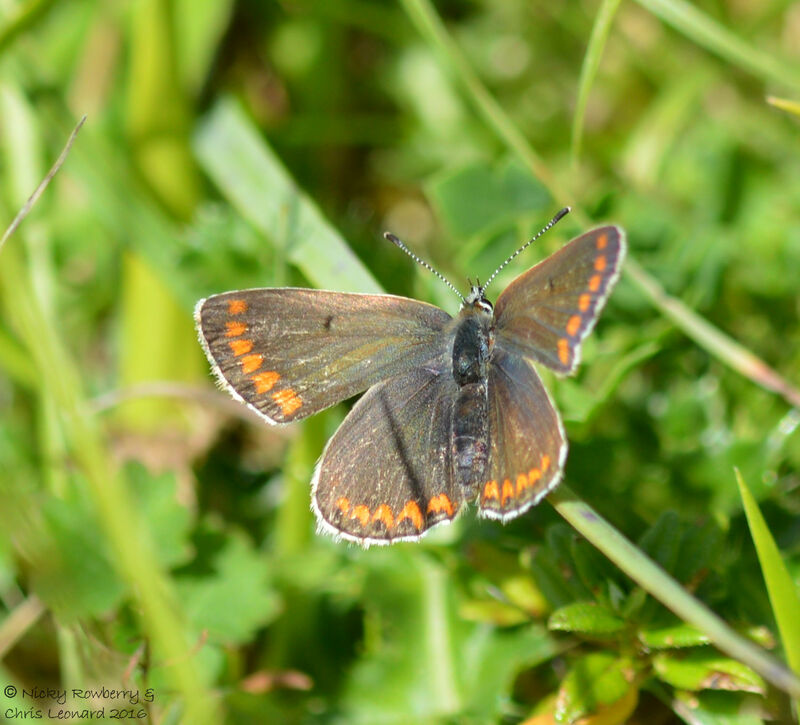 One of the highlights was our second ever Brown Argus, having only seen these for the first time last week at Prestbury Hill. Common Blues were abundant as well. The name implies somehow that by being common they are maybe ordinary, but when the light shines on the males in the right way (like this one below sharing a flower with another favourite of mine, the Swollen Thighed Beetle), they are simply stunning. The colours in the next photo aren’t quite as vibrant, but I love the way you can see the spots from the underside showing through. I think we get a bit hung up sometimes seeking out the new species of butterfly, so it was nice yesterday at Grafton to see some of the old favourite species and have time to appreciate them in their own right. 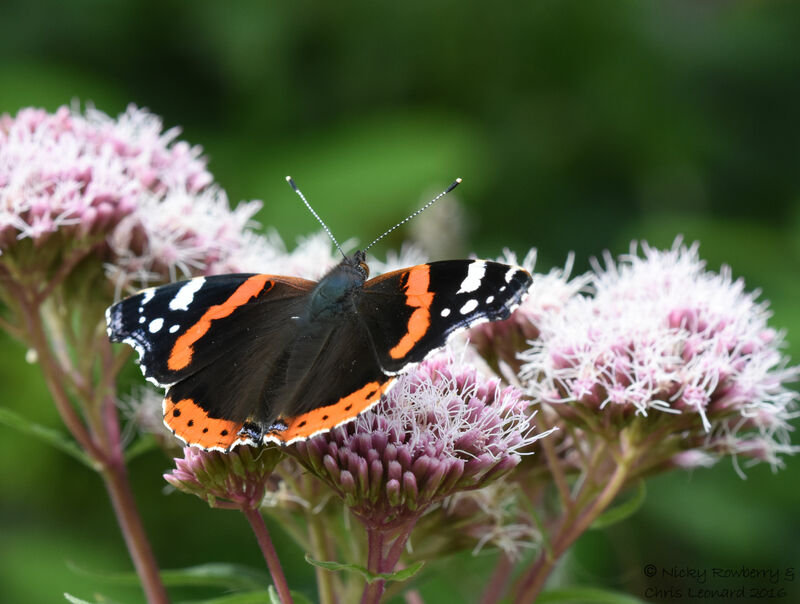 So in no particular order of preference – Red Admiral, Peacock, Green-Veined White, Brimstone and Small Copper. 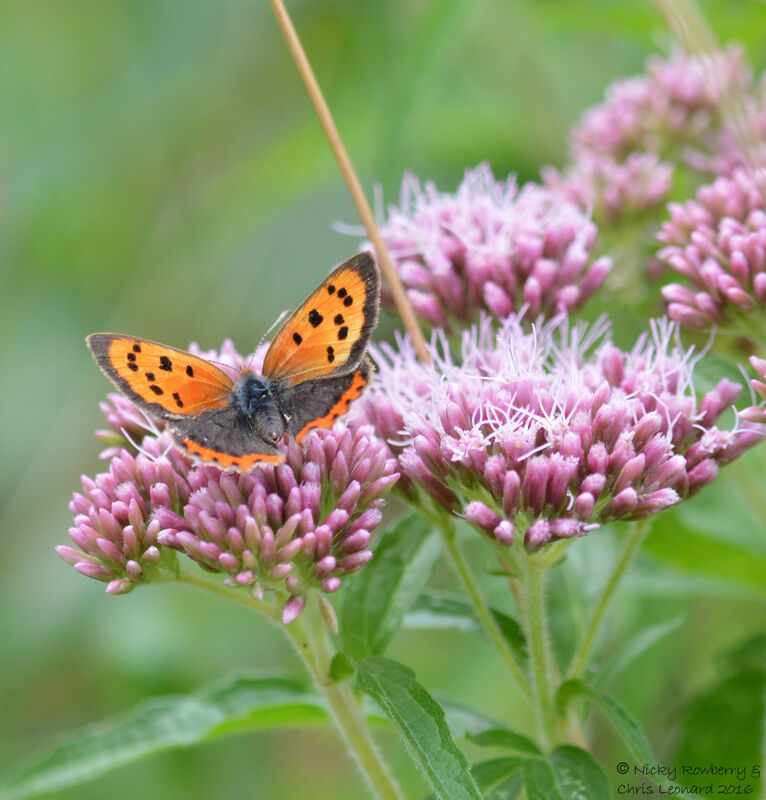 The Red Admiral and Small Copper can both be seen feeding on Hemp Agrimony. This plant seems to be a butterfly magnet and is the one we saw the Brown Hairstreak on last year. 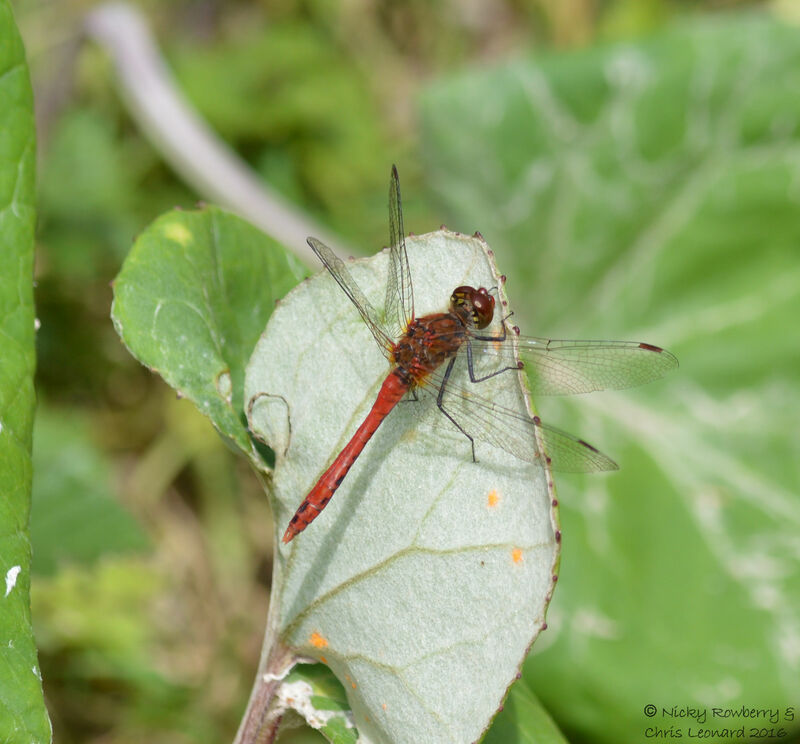 Butterflies weren’t the only insects of interest yesterday though – the dragonflies and damselflies were abundant too. Highlight was probably an Emperor dragonfly, but the swine thing wouldn’t land, so no photo of that. 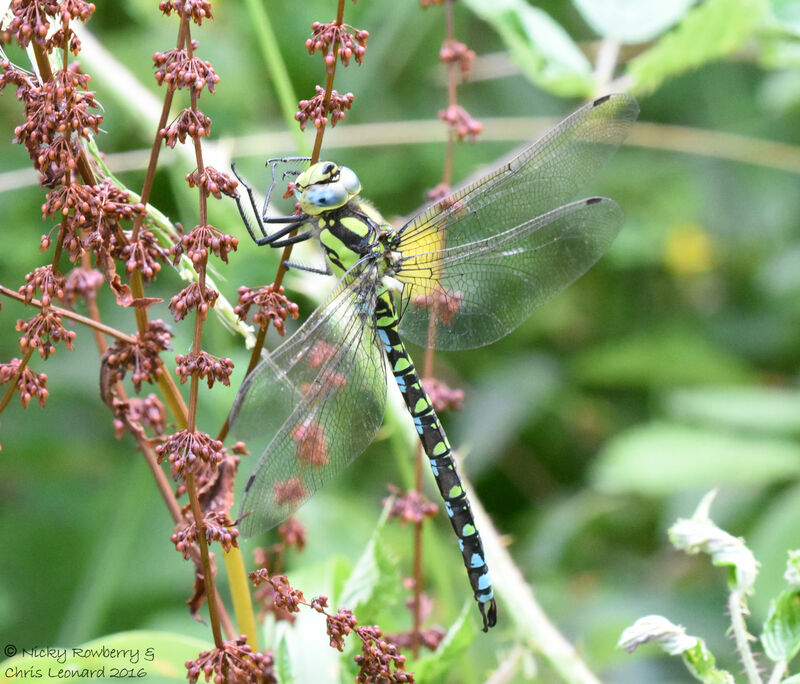 Next best was this Southern Hawker, which was almost as magnificent. There were lots of Darters about too. 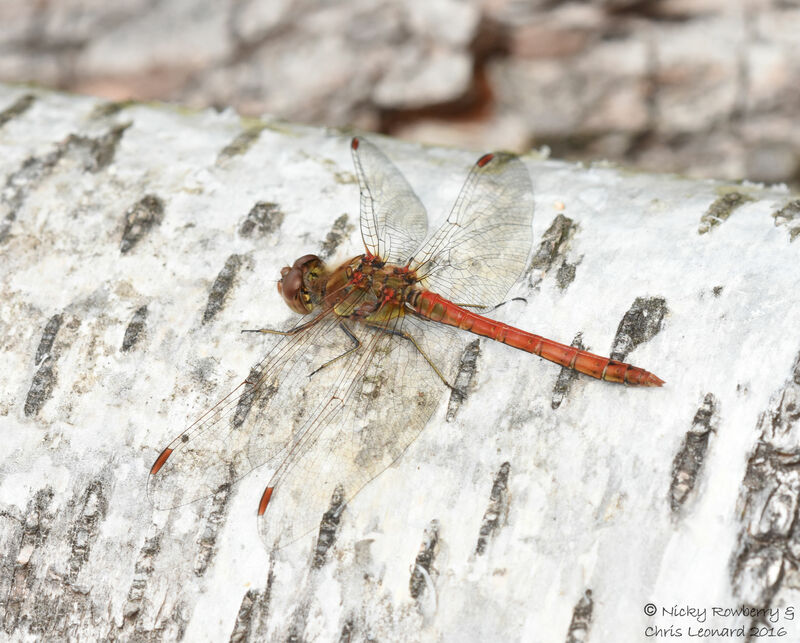 At first I thought they were all Common Darters (top one of photos below), but closer inspection of the photos back home revealed a Ruddy Darter too (bottom). The Ruddy one is a slightly brighter red, but the most diagnostic difference is the colour of the legs – the Ruddy’s legs are all black, whereas the Common has paler segments. 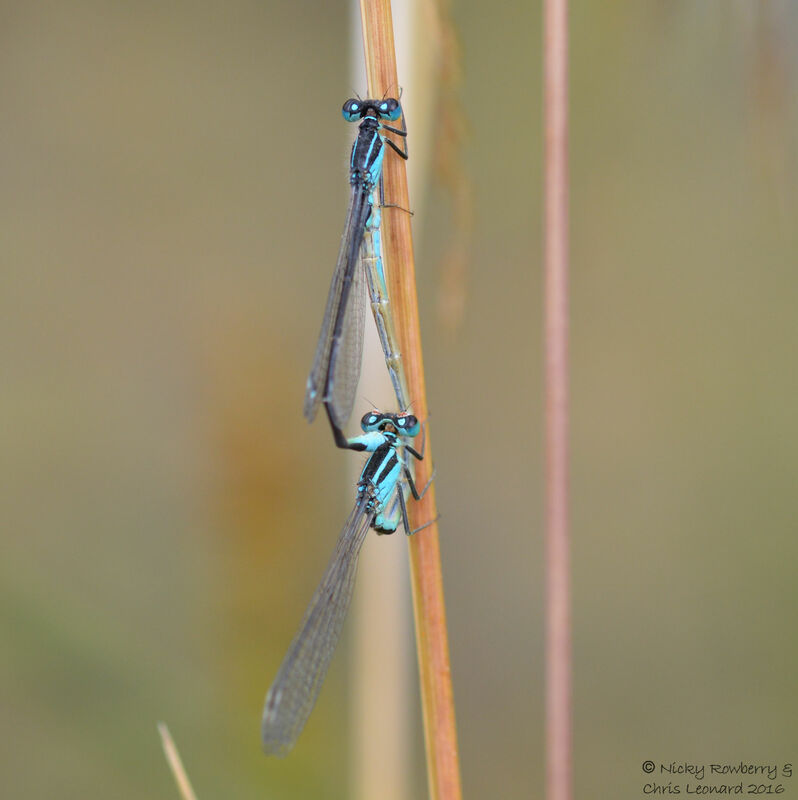 At a small pond we spotted this mating pair of Blue-tailed Damselfies – a new species for us I think. The male is the one at the top and he’s holding onto the back of the neck of the female below, while she curves her body up to his to receive the sperm. They can stay locked like this for quite a while! 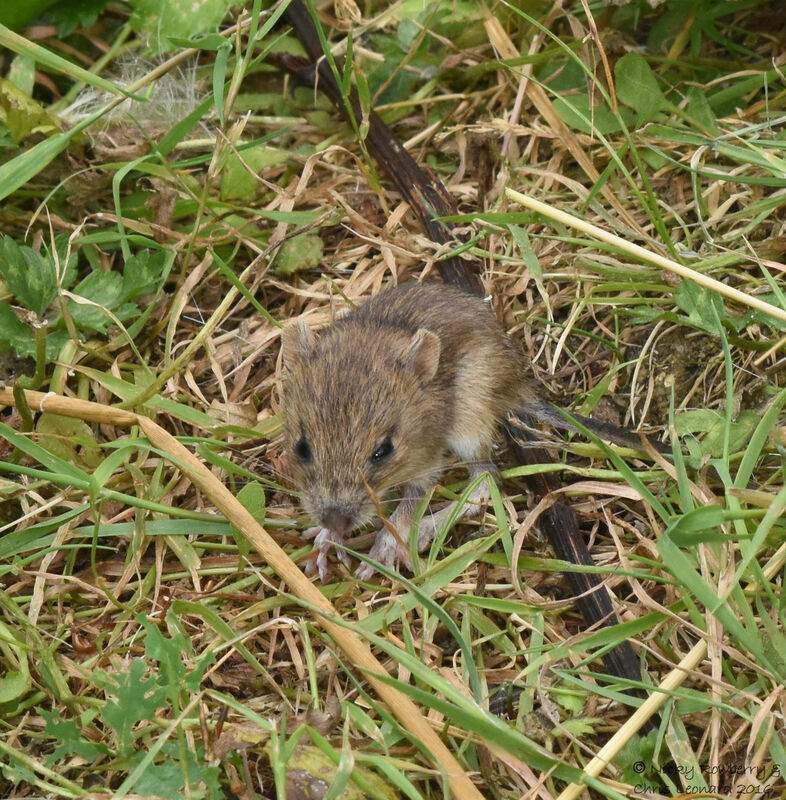 Our final sighting of the day was this poor little mouse. Lovely as it was to get a clear view, we think there must have been something wrong with it, as mice don’t normally sit out in full view like this to get their photos taken. Its eyes didn’t look right either; one seemed partially shut. As we weren’t sure though, we left it as it was for nature to take its course. Back at the carpark by Grafton church, we rounded off the day by finding our first ever geocache! Not the greatest level of difficulty, but we were pleased with our success on the first attempt. Another thing to get addicted to “bagging”! 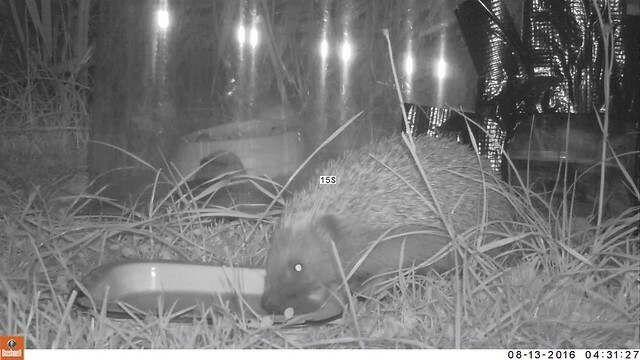 Our hedgehogs seem to be getting mighty picky with their food this week. After the successes of the first few nights of the feeding station, they’ve been turning their little hoggy noses up at my latest offerings. Lots of videos of them going into the box, looking at the food and wandering back out again. Of course because the neighbourhood cat can’t get into the box, I’m left with a bowl of smelly cat food to dispose of each morning.They will still eat the mealworms that I’ve been scattering about, but I read somewhere that they can become addicted to them, so I’m trying not to put too many of those out. So far they’ve refused 2 supermarket brands and two supposedly upmarket pet brands of catfood. I’ve been avoiding fishy flavours, but so far they’ve rejected chicken, beef, lamb and even duck! If anyone has any suggestions as to which is the best cat food to feed them with, it would be much appreciated. But there is good news. They may not be eating the food I’ve put out, but they have at least been drinking the water. We’ve been leaving bowls of water around the garden and I finally had the brainwave of leaving one in front of the camera. 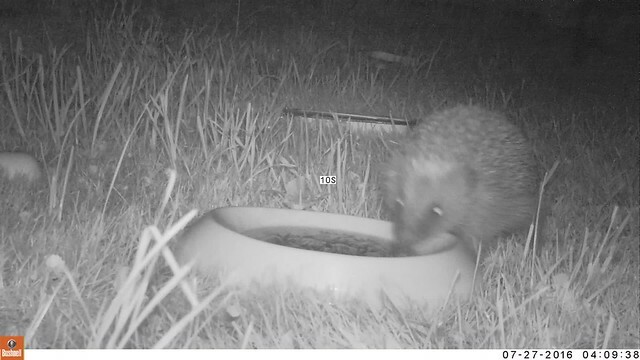 Sure enough at least one of our hogs has been drinking from it. They don’t show much respect for the water bowl though – this one tramping through it when he or she decides they’ve had enough! This is really good news as hedgehogs can apparently become dehydrated in hot weather. 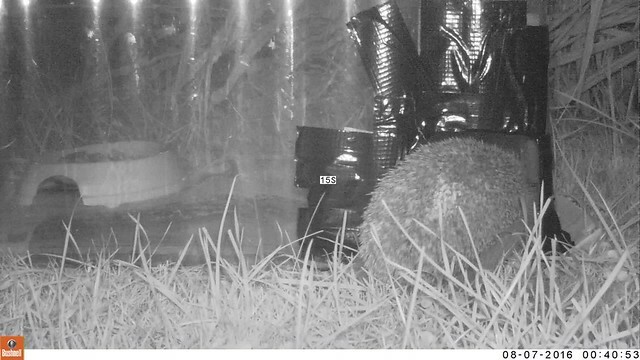 The Hedgehog Preservation Society advises all gardeners to leave water out for their hedgehogs (and for other wildlife). So you can lead a hedgehog to food but you cannot make him eat – but you can at least get him to have a good drink! Perhaps the not eating thing is actually a good sign – that they are not that hungry and our garden is providing enough natural food. I hope so. Out and About – Prestbury Hill – The Return! I’m not normally given to the expression OMG, but OMG Prestbury Hill is an amazing place! We made a return trip today to see the Chalkhill Blue butterflies that we didn’t see a few weeks ago (because I’d got their season wrong!) We ended up seeing 15 species of butterfly, a beautiful bird of prey, some moths, a new snail and a lizard! Pretty amazing for a few hours walking in beautiful countryside. We started leisurely by heading to a bench for a picnic (I’d love to be able to claim that I’d loving crafted cucumber sandwiches and other home-made delights, but actually it was left-over fried chicken from the night before!) 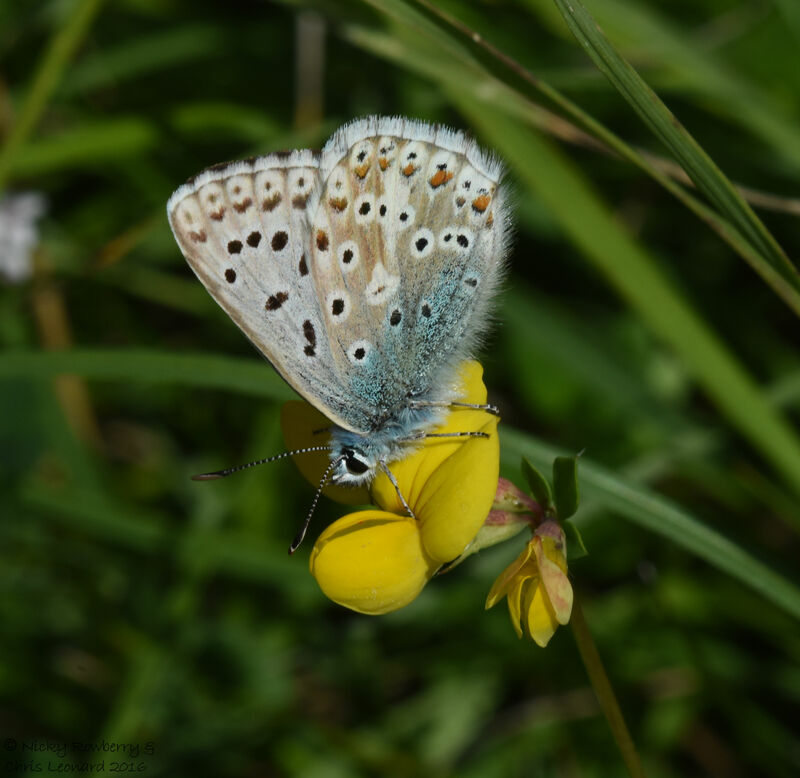 We spotted our first Chalkhill Blues before we even reached the bench, but decided to eat first then take photos later. Said bench has glorious views out over Cheltenham and beyond and is the perfect place for a picnic. 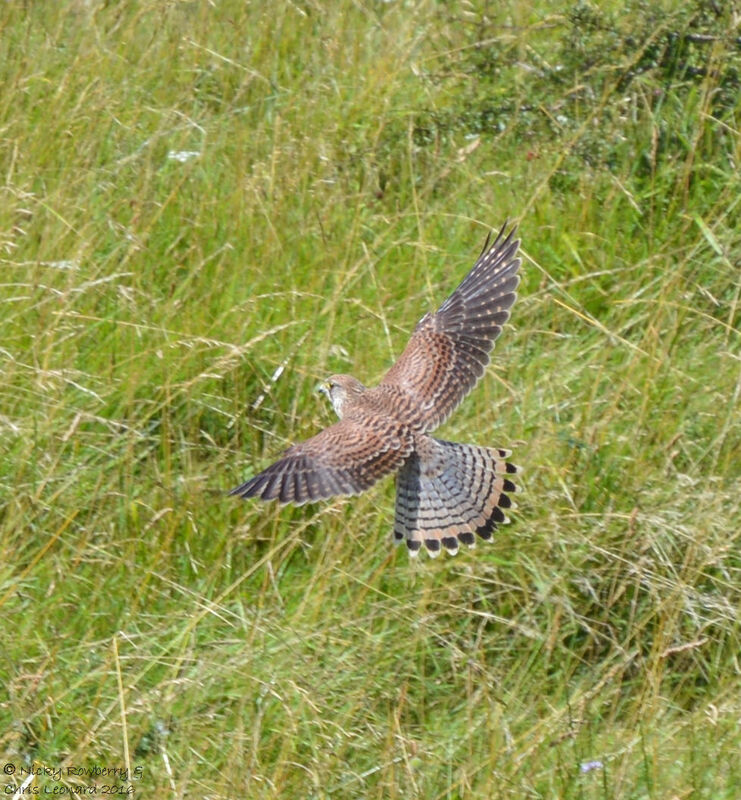 We could see a bird of prey hovering over fields below – turned out it was this beautiful kestrel. We couldn’t get very close, so this is taken zoomed in from a fair distance, but you can still see what a stunning bird it is. It hovered round about for much of our visit, never coming close enough for a better photo though. 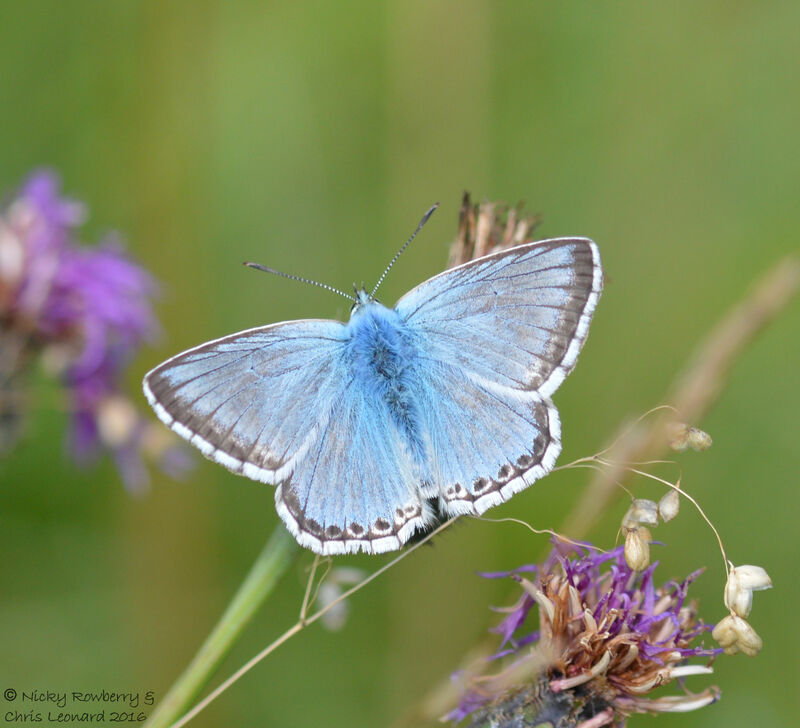 But by then we were distracted by the object of our desires – the Chalkhill Blues. 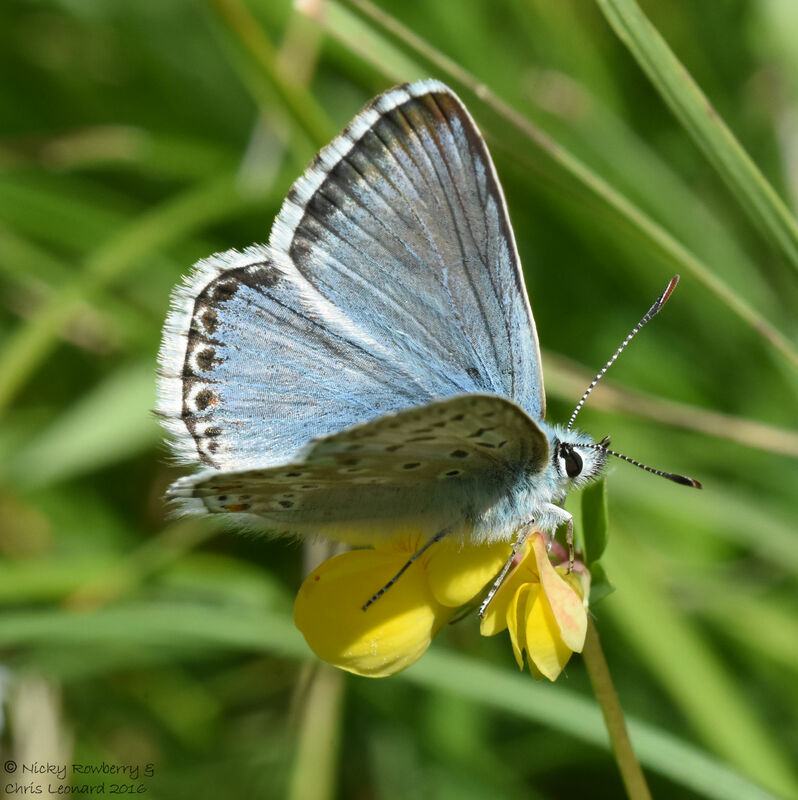 The beautiful blue butterflies need either chalk or limestone grassland (Prestbury is limestone) and are one of the last species to appear each year. The males have gorgeous bright blue upper wings edged with black. 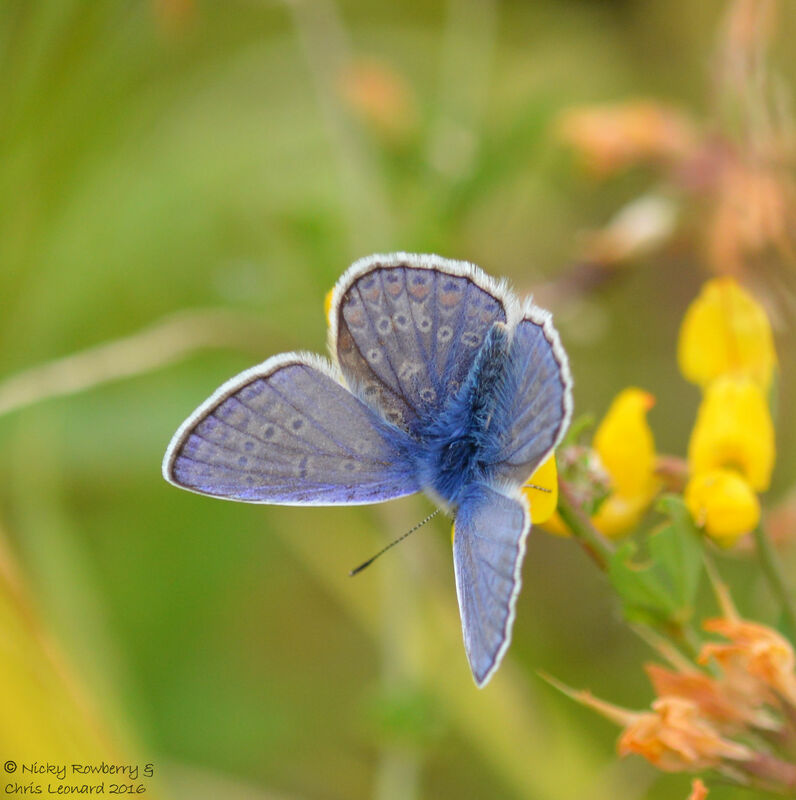 The underneath of the wings have a pattern of dots quite similar to the Common Blue. As is so often the case with butterflies, the female is much drabber. We saw mainly males today, but that could be just that they are easier to spot with their bright colouring. The few females we did see were often being pursued by more than one admirer. This one was having a quick rest between suitors. 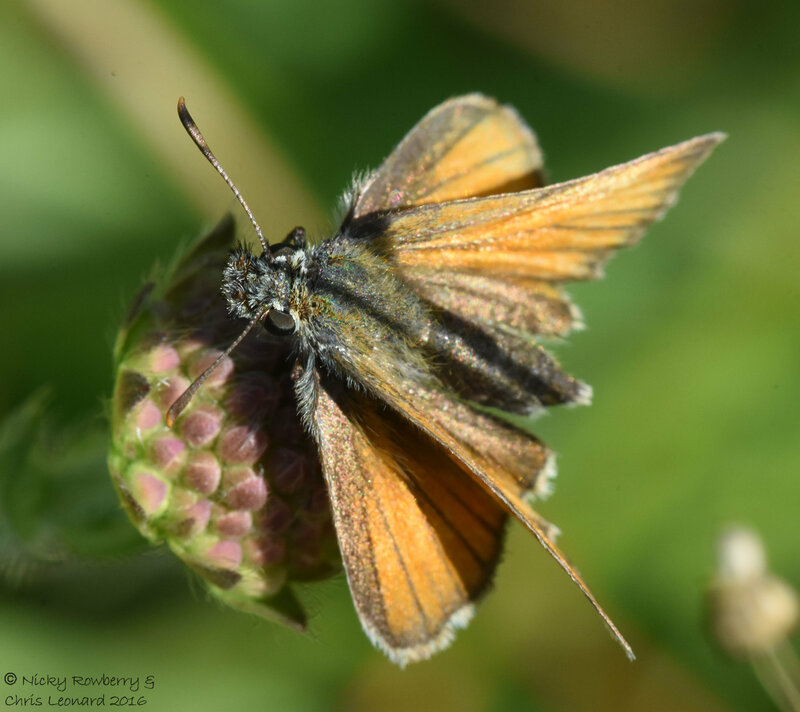 Already delighted with having bagged our Chalkhills we got chatting to some fellow butterfly twitchers, who knew much more about the area than we did and were very helpful. 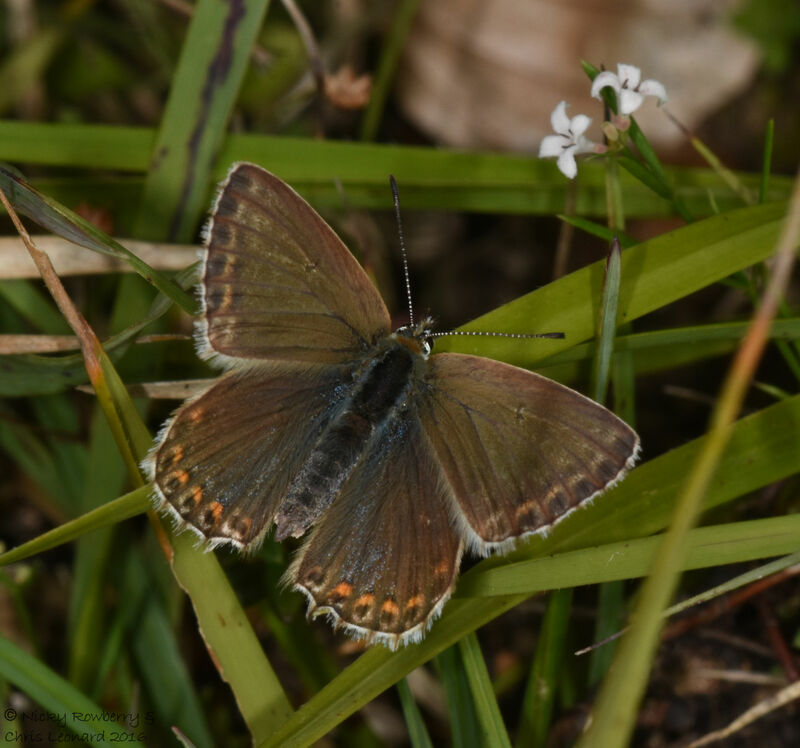 They mentioned that they’d seen Brown Argus further up the slope – a species that we’d never seen before. Needless to say we puffed our way back up the hill to the area they’d described in the hope of a second prize for the day. 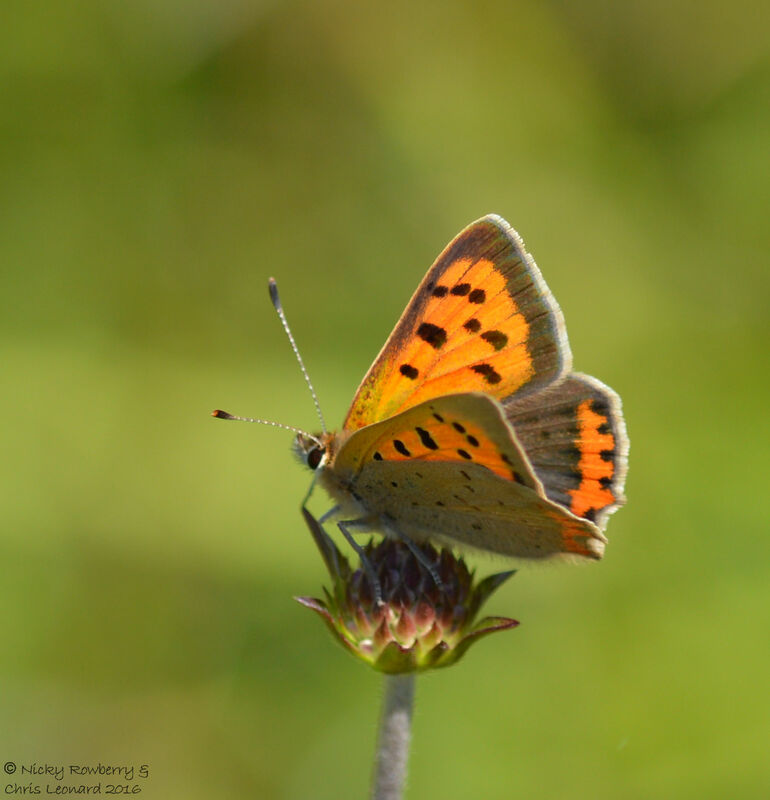 Chris caught a glimpse of something different, which turned out though to be some lovely Small Coppers. Our photos don’t really do them justice, but they were positively glowing a coppery red in the sunshine today. 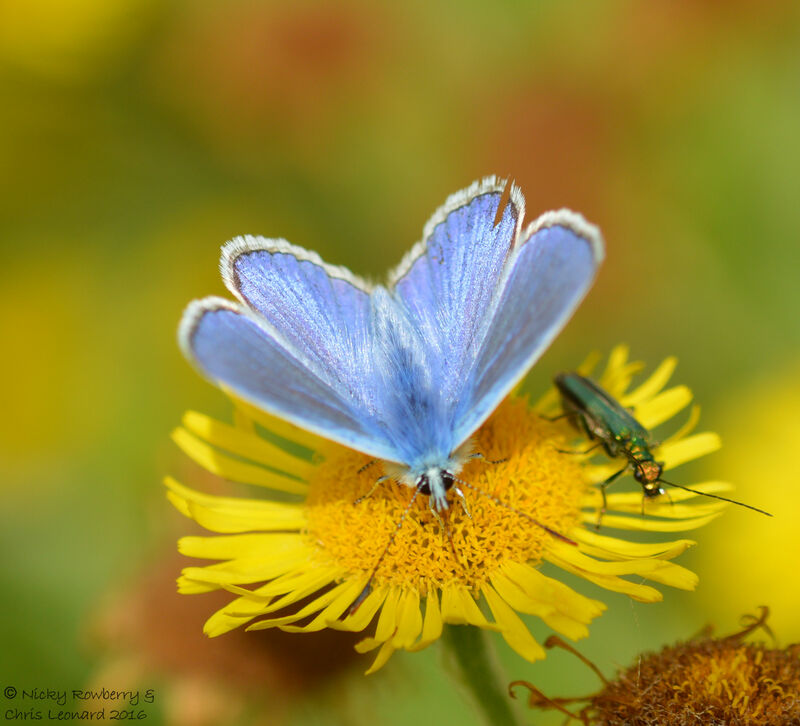 While Chris was concentrating on the coppers, I noticed a tiny, fairly plain little butterfly, so took a few quick photos thinking it would probably turn out to be a Common Blue. 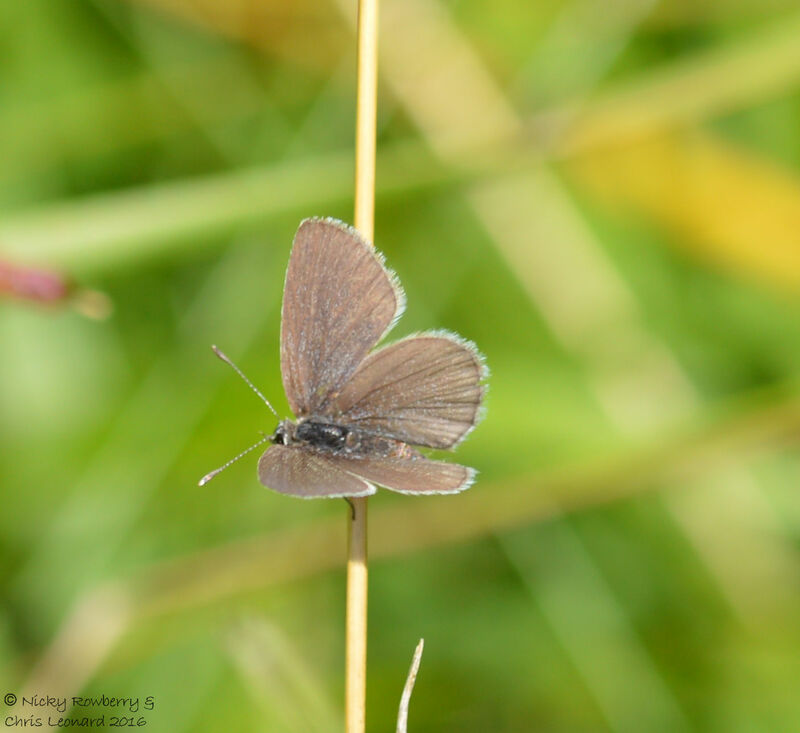 So we were amazed when I downloaded the photos later and realised it had actually been a Small Blue! Another new species for us – two in one day! 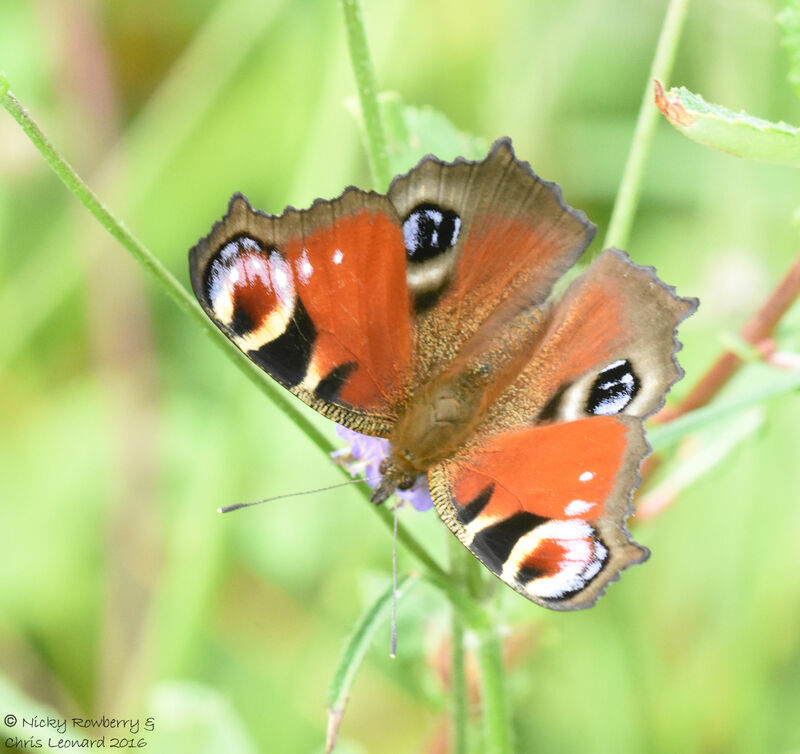 We carried on back up the hill and about half way up saw another small butterfly. 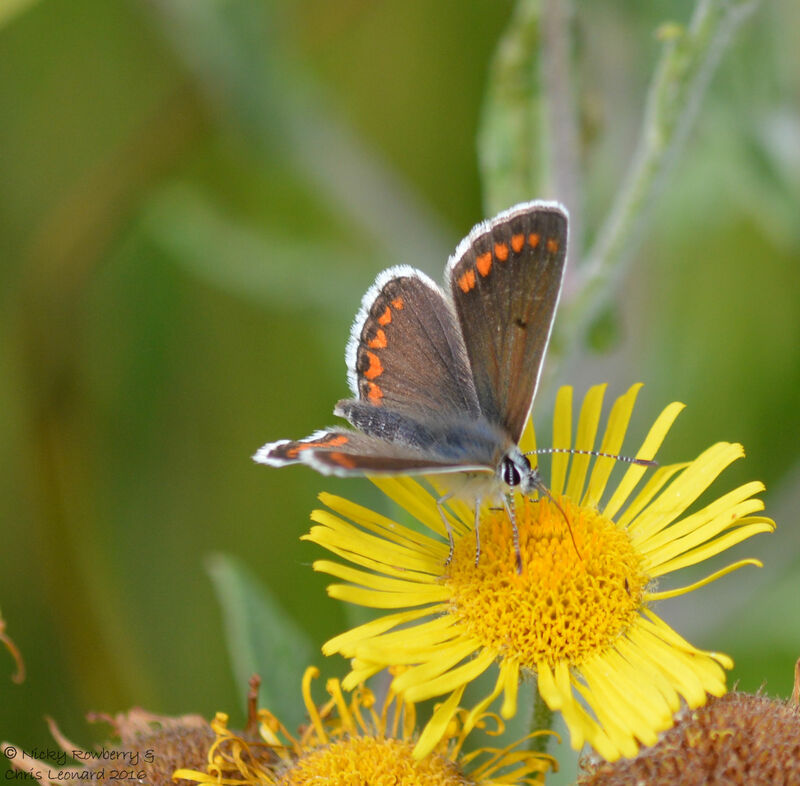 This time we’d found it – a male Brown Argus. Our third new species of the day! Again they look quite similar to the female Common Blues, but have the orange dots going right the way to the end of each wing. Obviously seeing three brand new ones was the highlight of the day, but we also saw 12 other species, including our first Small Skipper of the year and some nice fresh looking Gatekeepers. We also saw lots of these interesting snails. 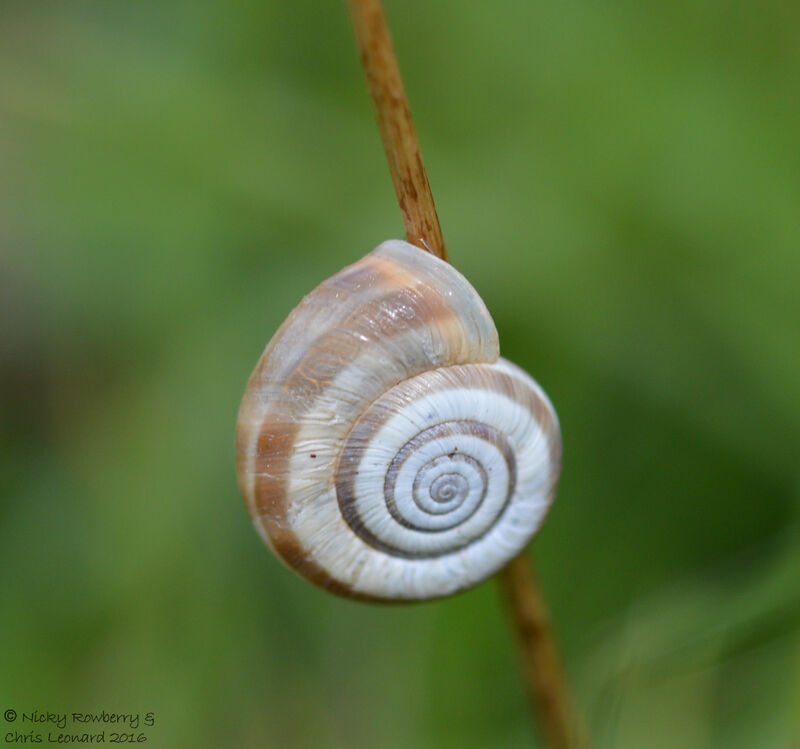 They are Heath Snails (Helicella itala) and seemed to have the habit of climbing grass stems like this. As we got back onto level ground, Chris found a lizard basking on the path. 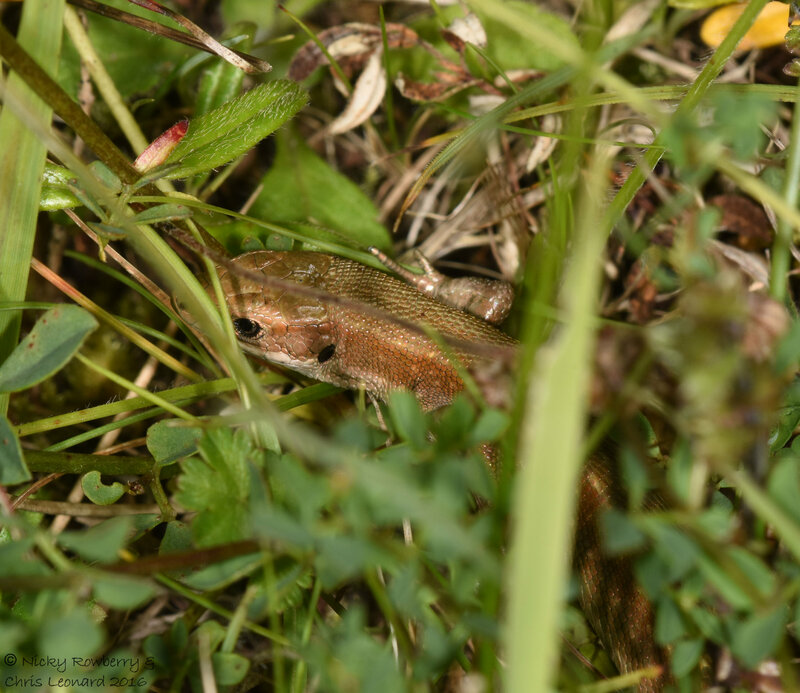 Of course the lizard spotted him before he spotted it, so it dashed into the grass – this was the best shot we got of it. 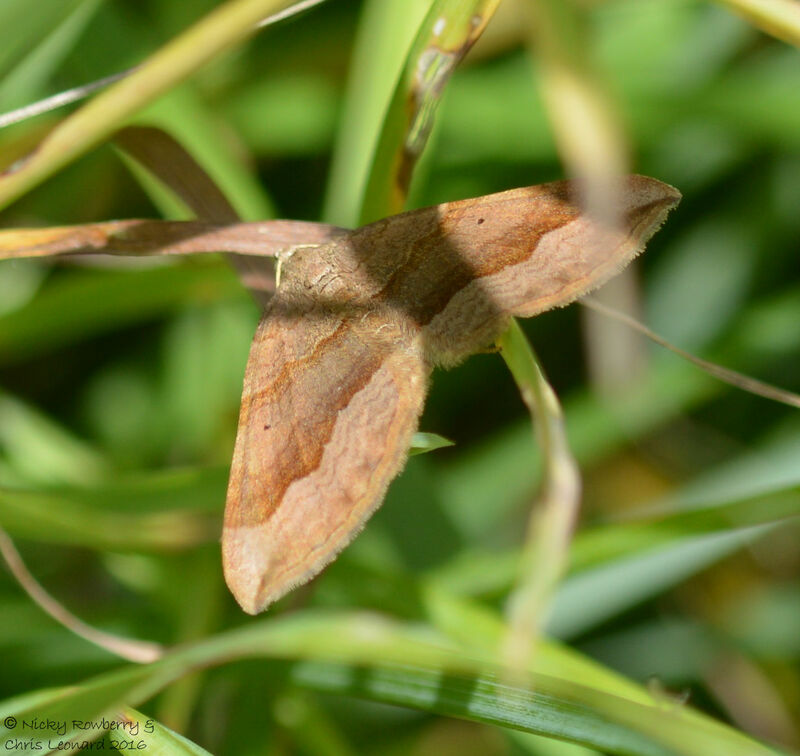 And finally we couldn’t have a day out without finding a moth – this time a Shaded Broad-Bar as we headed back to the car. So if you want to see butterflies, I can’t think of many places better to go than Prestbury Hill. And it still has more to offer – Duke of Burgundy butterflies in the early summer apparently, so we’ll be back again next year. For the last few weeks I’ve been on a bit of a mission to capture some footage of our garden hedgehogs. As always when using our Trail Cam it’s a bit hit or miss what footage we get, with the usual array of grass flapping and leaves falling tending to dominate the films. 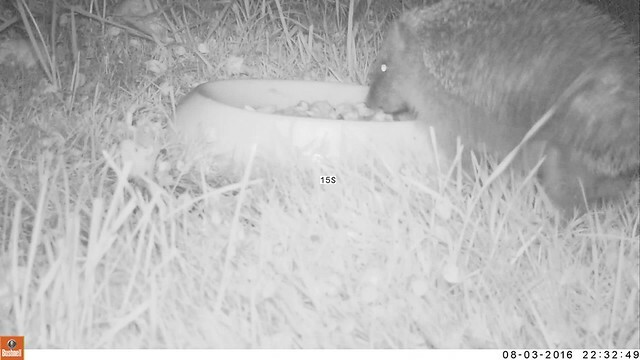 I’ve been putting out bowls of catfood, not just to try and film the hedgehogs but also to give them a bit of a helping hand when they might have young. 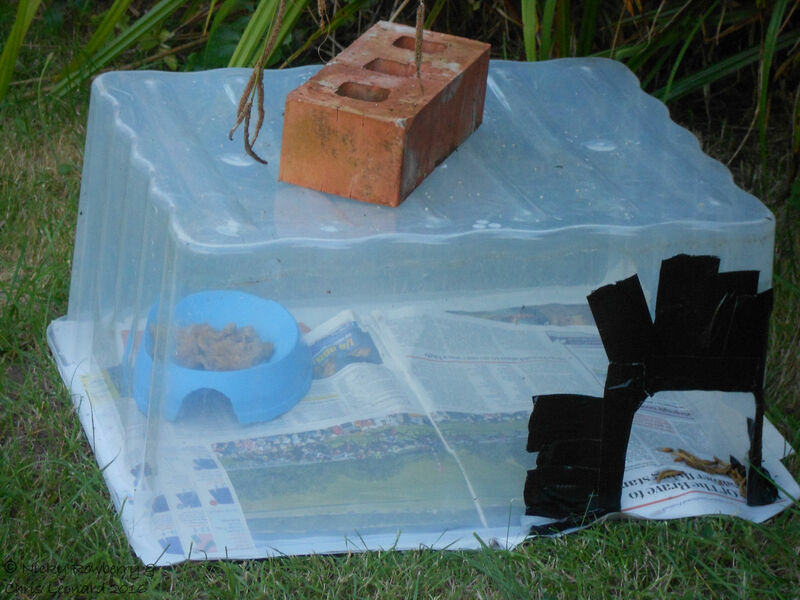 Not too surprisingly though, if you put out catfood you get – cats! 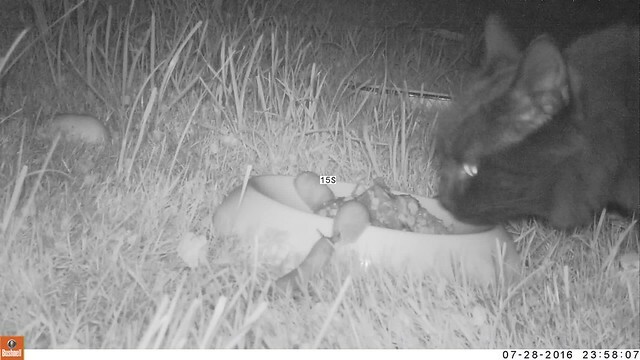 In this case one of the neighbours’ cats has learnt this is an easy midnight feast when he’s peckish, although in the footage below he has to share it with some very large slugs! I have an awful lot of clips of the same black cat stuffing his furry face each night. In an attempt to find something the hedgehogs would like but he wouldn’t, I’ve tried various other food options. Mealworms seemed like a good bet and sure enough the cat didn’t like them. Only trouble was the hedgehog didn’t seem to either. I’d soaked them in water to rehydrate a bit and then left worms and water in the bowl, thinking our hogs could get a drink too. Instead he or she waded in amongst them, then wandered off in search of something better. So it was back to the catfood again, until I happened to find a pack of blueberries at the back of the fridge that had gone a bit squishy for my liking. Again I thought this might tempt our hog – again I was wrong. They were all still there in the morning. On the plus side one of our blackbirds did like the look of them. I don’t know if he’s been in a fight with other blackbirds or even the cat, but he’s the scruffiest blackbird ever. 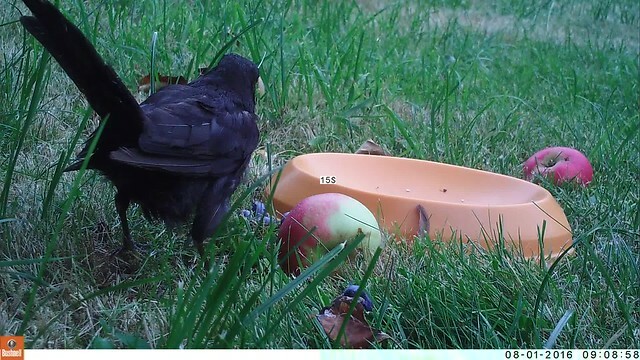 But he did like the blueberries – I was a bit worried when I saw this that he was going to choke on one, but he seemed to gobble them down in the end and is still flying tattily around the garden with no ill effects. 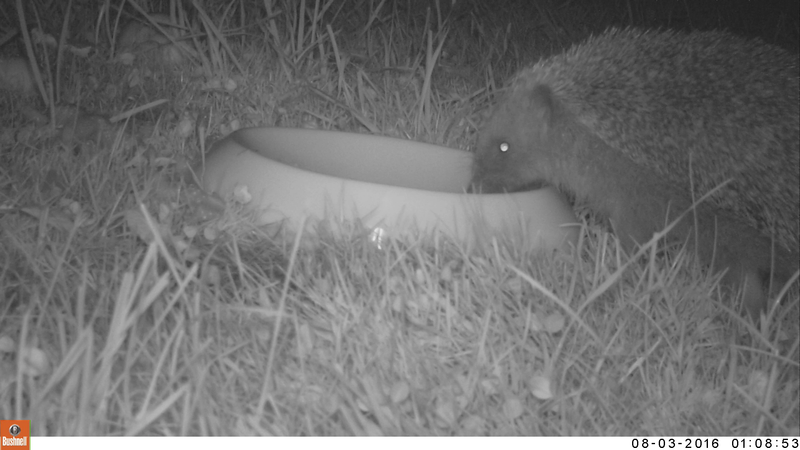 The robin (probably the same one who stalks my moth trap) has also learnt that the hedgehog bowl is easy pickings. He’s not that keen on the catfood, but has tried most of my other offerings. 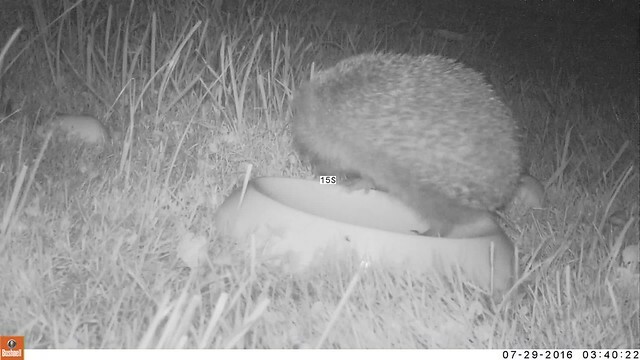 I have managed to get some clips of the hedgehog feeding or at least investigating the bowl. 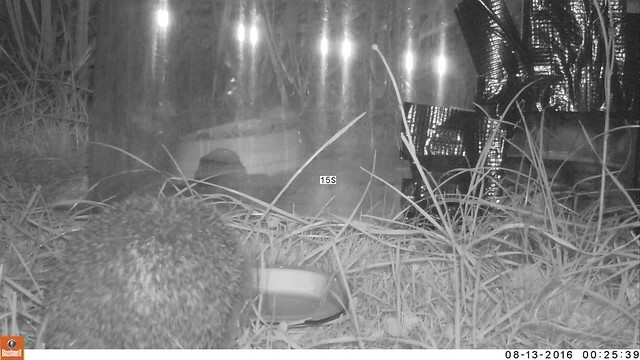 We’ve definitely got 2 adult hedgehogs using the garden as I’ve seen them some evenings, but never managed to get them both to come to the food bowl at the same time! 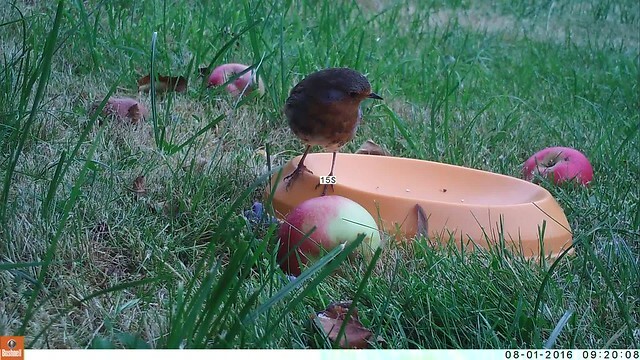 If nothing else my attempts to feed the hedgehogs are supporting a variety of other wildlife in the garden – blackbird, robin, slugs, assorted flies and spiders and of course the neighbours’ cat! 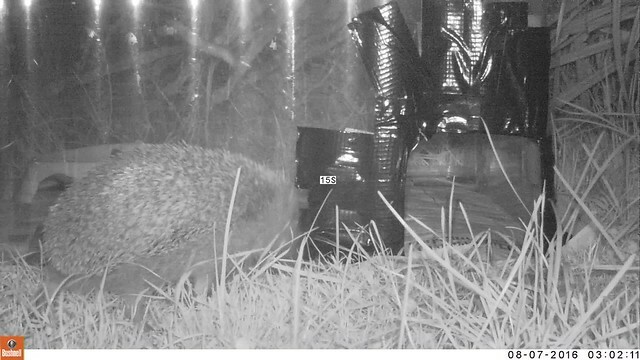 The brief glimpses we get of the hedgehogs though make it all worthwhile. 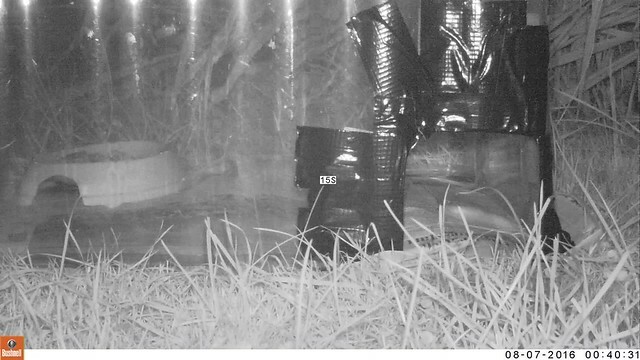 The clips may only be short (for some reason the trail cam won’t do videos of more than 15 seconds at night? ), but they give a small insight into the lives of our hoggy friends that we wouldn’t get otherwise.